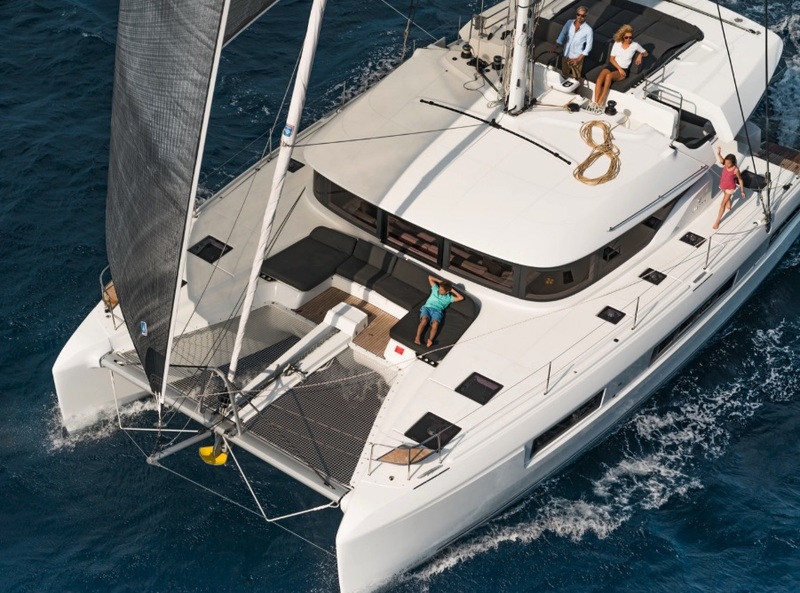 The 2018 Lagoon 50 is set apart from the crowd with new features and innovations. Nothing kills innovation faster than incremental improvement. Maybe that’s why nothing inspires it like a clean sheet of paper. Kudos to Lagoon for understanding that and tossing out preconceived notions. 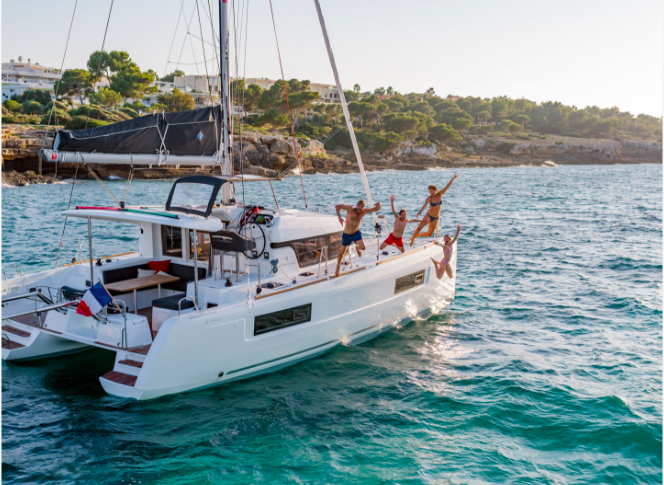 With the launch of the new Lagoon 50, the French catamaran builder tapped into true innovation in a world of evolutionary lookalikes. From the dock, the new cat still has two hulls, a coachroof and a flybridge on the composite bimini. Pretty standard stuff, I thought, until I stepped aboard and learned it was all different. The hydraulic swim platform, or the teak beach as some call it, carries the tender—but in a new way. The ends flip up to reveal added chocks for the dinghy. With the ends turned down, there are no chocks to get in the way and you can traverse from one transom to the other without walking through the cockpit. The job of the platform is the same, just done differently. The two squared-off transoms steps that lead to the cockpit are nice and low. Not only does this look sleeker, it’s also easier to transition from the water or dock to the main deck. To satisfy new industry regulations, the engine room hatches now open up and aft so checking the diesels under way will keep you in the cockpit and not out on the steps, which is safer. A seat spans most of the transom and while that’s fairly standard, the grill that’s inside the locker at the starboard end of the seat is unique. It swivels out and over the transom steps so you keep the smoke and heat out of the cockpit. That seems as if it were designed by people who actually spent time entertaining aboard. The Lagoon 50 was definitely designed with entertainment in mind. The cockpit table to port can be kept folded during the day to provide more room or opened up to seat eight for dinner. 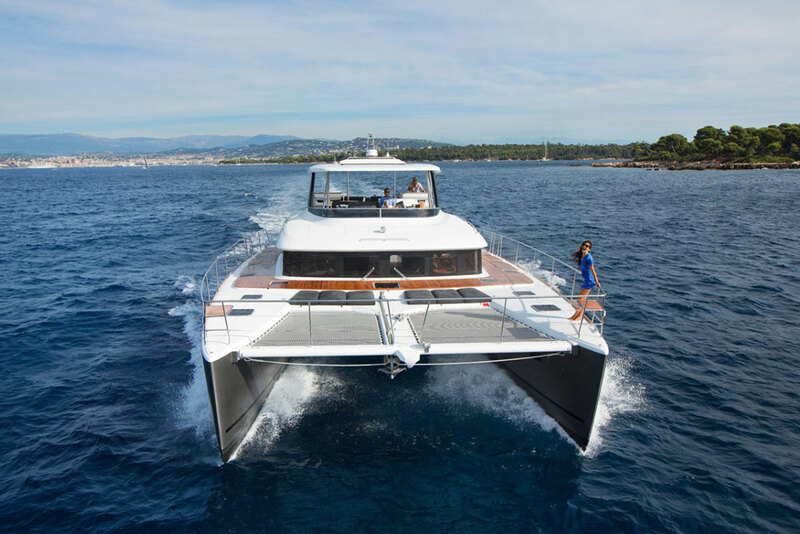 To accommodate a larger crowd when the table is unfolded, the forward seat detaches and moves up and over the molded steps that lead up to the port side deck. There are no such steps to starboard. Instead, there’s a twin lounge and an outdoor galley module with a sink, a fridge and a large countertop. I counted four new ideas and I hadn’t yet made it out of the cockpit. Stepping inside, I knew immediately that I was in for more original thinking. Normally, the cockpit is the most popular place on a cat, with the flybridge (if there is one) taking second place. 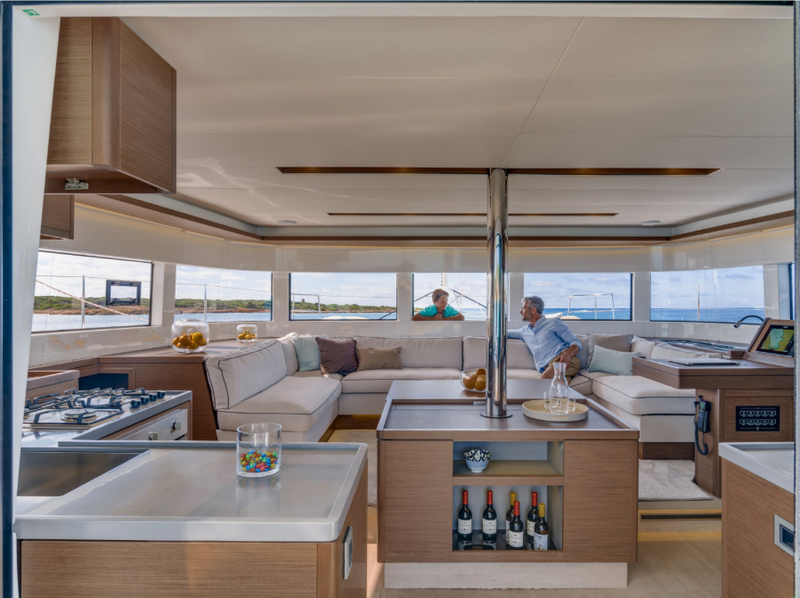 Although builders always go to the trouble of creating saloon space on the main deck, it’s mostly ignored by owners and charterers, except in times of inclement weather. Maybe Lagoon saw that as a challenge because they created an interior you’ll really want to hang out in. The nearly full-beam settee faces aft as it wraps around a table and center island that holds a popup TV. The upgraded table here has seemingly magical legs that are finished with chrome accents. Not only do the legs look like a work of art, they mysteriously articulate to lower and simultaneously move the table toward the island, making the settee more of a causal lounge where you can watch a movie. The table is an add-on but it’s such a conversation piece that any buyer will realize it’s such an interesting feature that it’s hardly an “option” if you want to impress in the anchorage. Anyone actually distance cruising will appreciate the space dedicated to the navigation station. To starboard is a large, outboard-facing nav desk with a B&G MFD, a VHF and an autopilot so on long passages, you can drive from inside. Although most navigation today is done electronically, real cruisers still appreciate a dedicated place for ship’s business. On our test boat, the desk was clad in leather that adds a feel of luxury. In fact, the aesthetic of the entire interior has been upgraded with a darker shade of Alpi wood, returning to the richer styling before grey dominated our lives. With lots of countertop space and a nice interior layout, it would be easy to host a dinner party while underway. The galley is positioned between the “living room” and the cockpit. 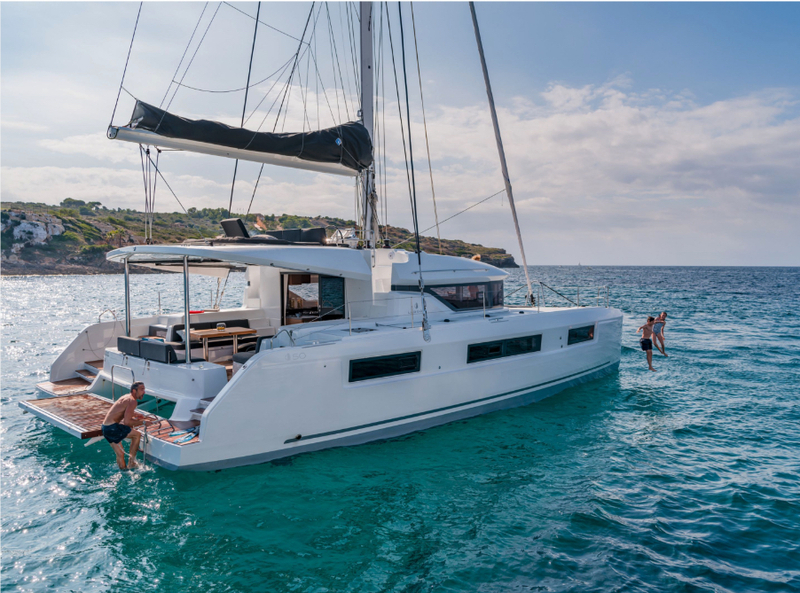 It’s split into two sections with the three-burner Eno stove and sink to port and two refrigerator drawers to starboard. With lots of countertop space, food and drink preparation can be done by multiple cooks and bartenders simultaneously without anyone stepping on toes or getting an elbow in the ribs. The aforementioned island console on the centerline also adds stowage space as it wraps around the compression post for the mast. With elevated expectations, I descended the starboard steps to the master suite that takes up the entire hull. I entered the cabin at the center, landing by an elongated desk with a built-in bookcase and a small settee. The walk-in closet was just ahead. This complete dressing area has three rows of three drawers to keep everyone organized and a skylight to the saloon above so it’s not a dark cavern. Forward is the head with his and hers vanities and a large shower stall. The toilet is in a separate compartment, not taking up space in the bath. Aft is a large island bed that is easy to access from either side. Discovering all the stowage options in this cabin is like a game. There are lockers hidden behind closets, plentiful drawers and even the backside of the sliding door that provides privacy for the cabin has an integrated magazine rack, so no space is wasted. 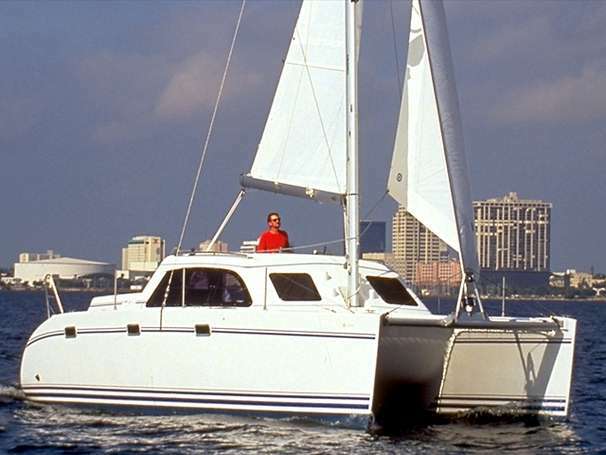 All around are fixed hull ports with opening insets and plenty of overhead hatches so the whole cabin is light an airy as if it weren’t down in the hull at all. Available configurations include 3-6 cabins and 3-6 heads. The extra cabins are tucked into the mid-sections and mostly eat up all that fabulous stowage space. These layouts will be popular for charter but the real distinction on this design is that owner’s stateroom that is unmatched on a cat of this class, so private buyers will likely opt for that. About 50 percent of these models will do charter work and I expect most will be flybridge models just like our test boat. The helm is on the flybridge, dead center behind the mast, which makes visibility forward a little awkward. A long bench seat accommodates the driver and at least three companions. The two-level dash is comprehensive with a B&G MFD and wind instruments angled toward the driver, and autopilot and remote windlass control on the lower surface. Engine throttles are to the right and two cupholders to the left. Three Harken winches manage allteh lines including the self-tacking jib sheets that are led here via sheet stoppers. Three integrated sheet bins manage the sheets and halyards and an electric drum controls the continuous traveler sheet. Aft of the bench seat is a triple-wide sunpad with lifting headrests and elevated sections at the knees. On long passages with the autopilot steering, this will be the place from which to drive while relaxing all the way. 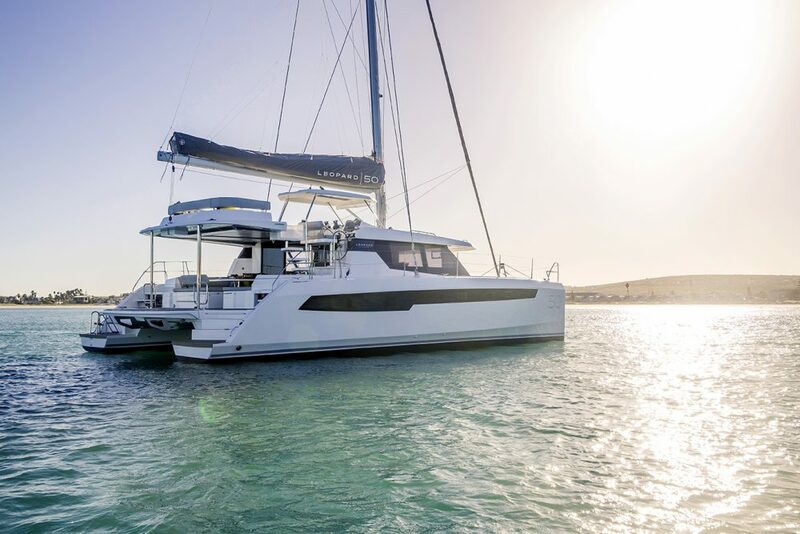 There's no shortage of comfortable sitting areas on this catamaran. You access the flybridge via two sets of steps—to port from the cockpit and to starboard from the side deck. Both sides could use extra handholds as we learned in our bumpy conditions. For those not satisfied with relaxing in the saloon, cockpit or on the fly, there’s always the foredeck with its integrated sunpads, U-shaped lounge and cocktail table of sorts sitting on the cover over the centerline windlass. The forward window slides down manually to open so drinks can be passed through directly from the galley. When the sun is beating down from the west while swinging to anchor in the trades, this will be the shadiest spot to curl up with a book. 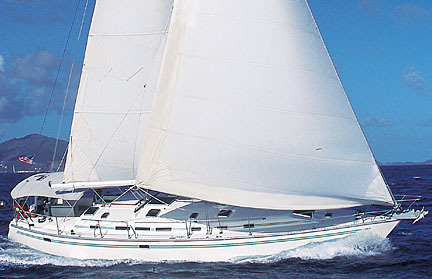 With 1700 square feet of upwind sail area between the standard full batten mainsail and an 87 percent self-tacking jib, our test boat was not under-canvased. The mast, which was moved aft to prevent hobby-horsing, is 87’ high giving this cat a higher aspect ratio rig to catch the wind up in the rigging. With 12-16 knots of true wind off South Beach in Miami, we had some lumpy seas. We sailed at 5.1 knots at 60 degrees of the wind and that bumped up to 7.4 knots as we cracked off to 140 degrees. The Lagoon 50 displaces nearly 46,000 pounds dry. To get the most out of her, you’ll want to opt for the Code 0 that briefly delivered 11.4 knots on a beam reach. 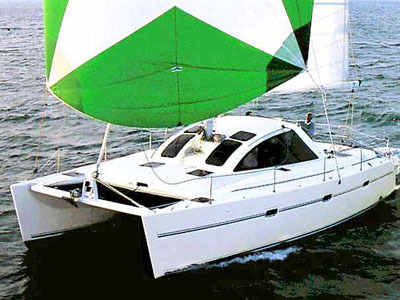 The twin 57 HP Yanmar diesels (upgradable to 80 HP) with Saildrives and folding propellers, delivered 9.5 knots at 3000 rpm (wide-open-throttle). 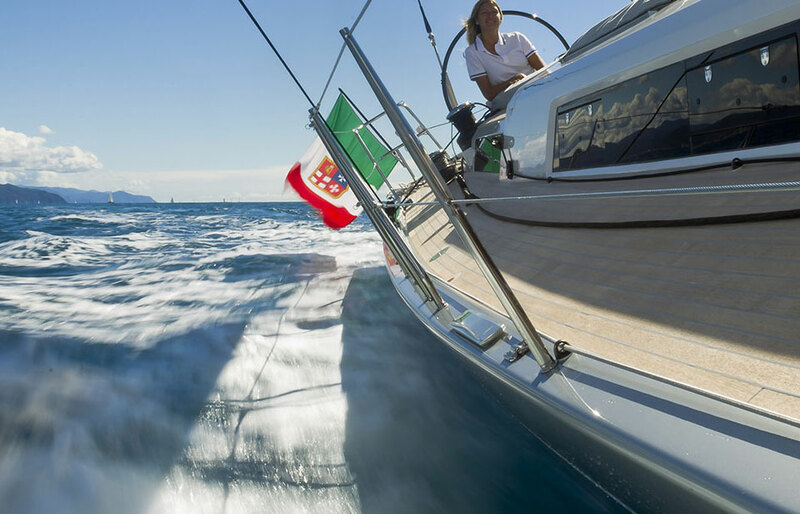 A more fuel efficient speed can be found at 2200 rpm and 7.5 knots. 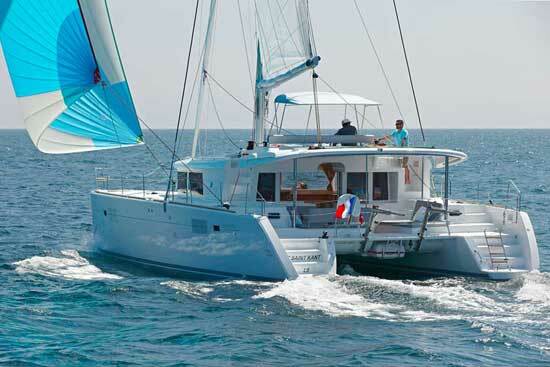 Who knows where owners of the new Lagoon 50 will wander with this new model. One thing’s for sure though—some of the design’s trailblazing was already done when she was designed. Oh the places you can go—when you start with a clean sheet of paper. Sail area 1,701 sq. ft.